In this intergenerational seminar, Penn students and West Philadelphia Cultural Alliance members together read groundbreaking playwright August Wilson's 20th Century Cycle: ten plays that form an iconic picture of African American traumas, triumphs, and traditions through the decades, told through the lens of Pittsburgh's Hill District neighborhood. Students and elders get to know each other while exploring the history and culture that shaped the plays. No prior theatre or writing experience is required. The course includes opportunities for students to write, direct, perform, and stage manage. It's also a chance to have your writing workshopped with and performed by some extraordinary Philadelphia actors, including icons like Cathy Simpson and Johnny Hobbs Jr, and up-and-coming talents like Carlo Campbell and Danielle Leneé. As an Academically Based Community Service (ABCS) course, the class plans and hosts events with the West Philadelphia Cultural Alliance, learns history through storytelling, and writes an original theatre piece inspired by the readings and relationships, to share at an end-of-semester performance. 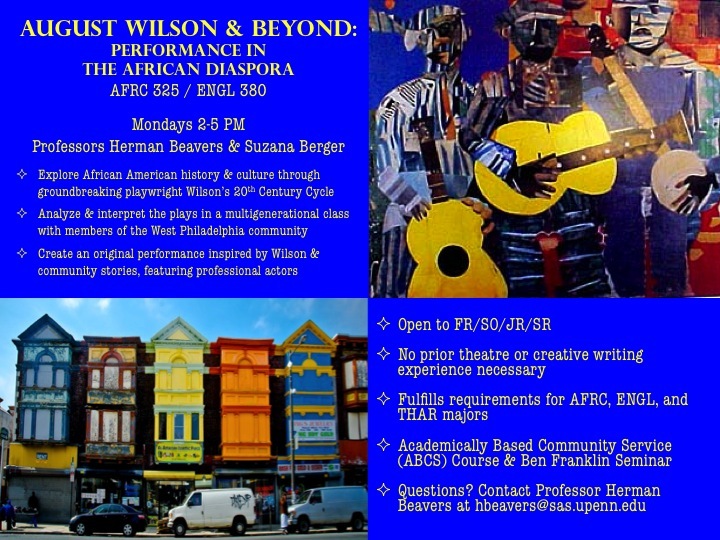 Wilson's plays provide the bridge between the two groups and art is the service they provide to the community together.